A new book is out, about 'the old guy' - il vecchio - Gino Bartali. A.k.a. the 'iron man' (uomo de ferro). Or 'Gino the pious'. Or 'Gino the Terrible' (Ginettaccio). Bartali had a lot of nicknames. So much has been written about Bartali in the anglo cycling press, but more about his cycling exploits, less about the man. For me, his character is a lot more interesting. 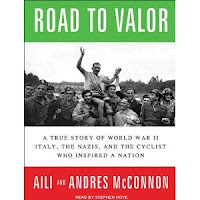 A new book, Road to Valor, goes deeper into the story of a man who during the World War II risked everything to save Jewish refugees...and who after the war crucified Bobet and Robic in the Alps to literally save all of Italy from the brink of revolution. Our local club time trial series started last night. It was a scorcher too... 95 degrees F, and high humidity. I was lucky I got to spend the day indoors air conditioning and off my feet, a luxury that paid off in spades, as I achieved best time on the night! 19' 07", for 8.15 miles. Last time I got a result like that was in 1984! OK, a reasonable ride, but certainly nothing worth crowing over, (so please forgive me putting it on the www!) Still, I've gotta admit, it did feel good. Over 25mph is not bad for an old man... but I know it's still pretty far behind many of the speed others masters my age achieve... and light years away from Wiggo and company. But then again jongens, Flandria Cafe 'ain't got no' SKY budget, where price is no object in seeking incremental gains against the watch.